Solar power fueling the military | West Coast Solar, Inc. 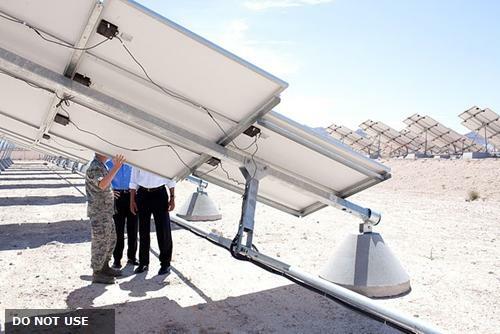 The U.S. Armed Forces are moving towards solar energy to meet their power needs in the future. A report recently released by the Solar Energy Industry Association (SEIA), an organization that promotes the solar power sector, highlights some of the recent attempts to integrate photovoltaic panels into the military’s energy infrastructure, which currently relies heavily on fossil fuels to power its bases and vehicles. This has severe consequences for both the Pentagon’s finances as well as troop safety. The military is the biggest consumer of energy in the world, spending roughly $20 billion a year for fuel. While it is able to purchase gasoline for $1 a gallon, it actually costs $400 per gallon to transfer this fuel to bases and outposts spread throughout Afghanistan, and the transfer itself is extremely dangerous as insurgents often attack truck convoys with improvised explosive devices (IEDs). Therefore, it is imperative for the military to wean itself off fossil fuels and instead adopt more renewable energy sources to power not just overseas bases, but its domestic facilities as well. The SEIA report states that the Armed Forces currently have 131 megawatts (MW) of solar electric generation capacity installed at bases in 31 states, and that there are plans for another 1.1 gigawatts (GW) of capacity to be added between now and 2025. This is part of a larger effort to add 1.9 GW of renewable energy production to the military’s infrastructure, with the goal of making the Army, Navy and Air Force more energy independent while also stabilizing costs. If you’re interested in learning how your business or institution can benefit from this technology, contact West Coast Solar, the leading California solar installer, for more information.